Webcam is an important device if you are using the desktop. While few all-in-one desktop PCs now come with the integrated camera, custom built PC and few other do not offer the integrated webcam. The webcam is important because video calls are now a part of our daily life. We all use one-on-one video calls, multi-user video conferences, Facebook live and more. If you are into vlogging, you already know the importance of webcam. Respolution: The higher resolution, the better web cam is. Frame Rate: The higher frame rate, the better web cam is. Autofocus: It must have autofocus. Adjustability: It is important for better experience. Logitech HD Pro C920 is one the best and affordable web cam you can buy. It can record 1080p videos at 30 frames per second. It is autofocus and can also capture photos at 15 megapixels. It also has integrated Wideband microphone for good audio. The web cam is flexible, so you can easily mount it anywhere. It can be rotated halfway in both directions for an all-around view. It also has a tripod mount. But it is bulky, so It cannot be your companion during travel. It doesn’t look like a webcam but a security camera but it is worth to try. LifeCam Studio is a pretty good webcam in the budget segment. This mode was specially designed for business conferencing, so the microphone is also very good. It offers features like color correction, autofocus, Skype certification and ore. It also has a tripod mount. This is flexible and can be tilt up and down and swivel around in 360 degrees. Logitech HD C615 is another nice webcam by Logitech. It is cheaper but offers a similar experience. It does not record 1080p at 30 fps and image quality is also not that much of good. But it is good considering the price. It also has a tripod mount and it is better in flexibility that C920. It is portable and folds down to fit in the tiny portable case. This webcam is designed to record wide-angle videos and photos. So, it is the one if you want your entire family to come into the video while on video calls. It captured full HD videos at a wide angle of up to 120 degrees. It can also capture 12 megapixels still images. It is flexible and rotates 360 degrees. It also tilts up and down. The best thing about this webcam is that it allows manual focus. This is another nice 1080p camera for excellent video quality. It has high-definition five-layer glass coated lens which enhances the picture clarity. It also has a built-in microphone and records Omnidirectional audio. It also looks like a security camera. 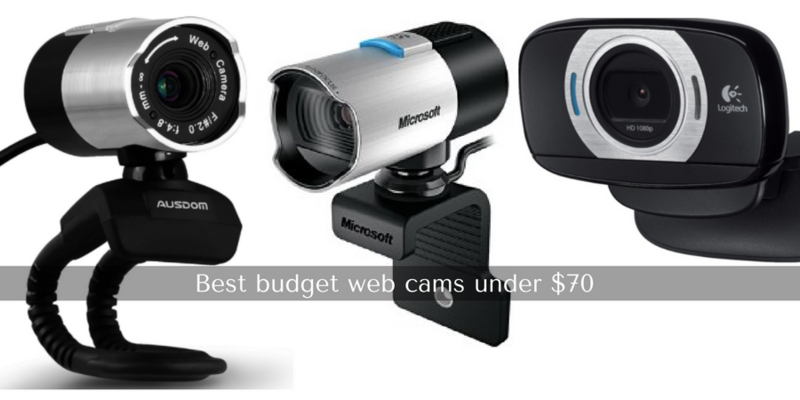 Do not forget to let us know what web cam you ended up choosing. Let us know your views in the comment.